The Stable is a pet friendly holiday cottage in Aberystwyth, and the third of our large cottages at Bryncarnedd Country Cottages, with 3 bedrooms sleeping up to 8 people. This property is also suitable for our disabled guests, with all living accommodation and 1 bedroom on the ground floor. 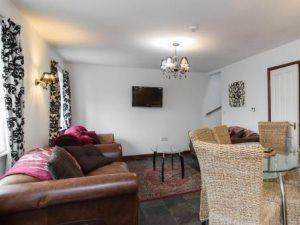 The cottage is open plan in layout with a large open plan lounge and dining room. Bedroom 3: A family bedroom with a double bed and a single bed, shower en-suite. We can add an extra single bed into this bedroom if required.